IF YOU LOVE nothing better than browsing the jam-packed shelves at your local bookstore, or if you have a much-used e-reader but still love buying a paperback, then you’ll understand what the Books Are My Bag campaign is all about. The bookselling landscape has changed hugely in recent years, with online retailers like Amazon fulfilling the bookselling role for many consumers. But a campaign launched last year aims to get people showing off how much they love their local book store, to demonstrate that there’s still a massive role for the bricks-and-mortar bookshop. 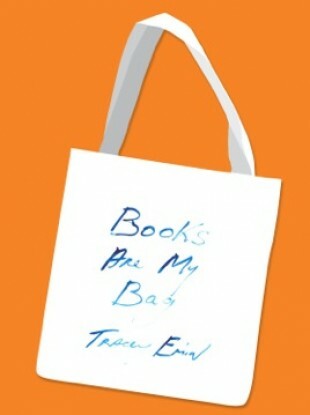 The Books Are My Bag campaign was launched in April 2013 at the London Book Fair, with over a quarter of a million bags emblazoned with the slogan distributed across the UK and Ireland’s chain and independent bookshops. Now the second iteration of the bag is being launched tomorrow, with artist Tracey Emin stepping in to design the latest version. Maria Dickenson is the managing director for Dubray Books, and previous to that was the head buyer for Eason’s. She agreed that the art of bookselling has changed, but sees how much love people have for physical books in her workplace every day. She explained that the bag is for people to “celebrate their love for their local bookshop”. Bookshops have organised events to celebrate the launch, with authors – like David Nicholls and Joseph O’Connor – visiting Dubray’s stores to meet their readers and sign the bags. Dickeson noted that the day coincides with “super Thursday”, which is the biggest day on the publishing calendar, with 1569 books due to hit the shelves tomorrow. “You see the highest footfall and highest number of people coming in – with an uplift of about 6% in sales,” she said of super Thursday. “While the market has changed, there is still a very strong role for physical bookshops,” asserted Dickenson. She said that you don’t get the same experiences browsing online as you get from engaging with a person in a bookshop – like recommendations for other books that you might never have heard of, or which are totally different to your first choice. Dickenson said that 80% of readers value interactions with authors, which is something that Dubray highlights with its regular book signings. Another way bookstores have adapted to the new ways of selling books is by being proactive about trends. Then they can present the books to customers along those themes, and open their eyes to new reads in the process. But Dickenson is certainly not anti-online bookselling. “There’s room for everybody,” she said. “The e-book is very convenient, particularly when travelling.” She added that publishers have been investing in the look and feel of physical books too to make them lovely items to own. Do you shop in bookshops? Email “Do you prefer buying books in bookshops or online?”. Feedback on “Do you prefer buying books in bookshops or online?”.